Dezeen promotion: international carpet tile manufacturer Interface has announced the release of Human Nature, a new flooring collection inspired by forest floors, grassy fields and pebbled garden paths. The concept for Human Nature is rooted in the notion of the "hackable" office, where modal furniture and temporary structures can be rearranged to change and shape the space. Conceived by David Oakey, who specialises in sustainable design, the collection includes five 25 centimetre by one metre skinny plank carpet tile patterns that can be combined with 50 centimetre by 50 centimetre square tiles in a variety of ways to adapt to different work environments. "Scientists have found that humans crave sensory change and variation, though our work environments are often flat, unnatural places," Oakey explained. "And though there's no doubt that the design community is drawn to the aesthetics of concrete, stone, and wood, the physical and acoustical benefits of soft surfaces are impossible to ignore." The collection was created with the idea that naturally-inspired workplace interiors can help make work environments more friendly, healthy, flexible and informal. "At Interface we are very inspired by biomimicry and biophilic design principles – the more we learn about our natural world, the more we're inspired to change the way we approach design," said Interface executive creative director Chip De Grace. With this in mind, Interface developed Human Nature with 81 per cent recycled content, including 100 per cent recycled content nylon yarn, partly sourced from NGO partnership Net-Works. Picture vast collections of people united not by national identity, but through global and international cyber-networks, living in a world without borders, and experiencing days that never end. In many ways, thanks to technology, this is the context in which so many of us around the world work today. It's a context in which the only constant is change. In such a dynamic environment, it isn't surprising that workplaces – like the people and processes that populate them – are changing, too. Architects and designers have joined forces with researchers and industry visionaries to craft working environments that bolster new ways of working and interacting. We now work in offices that look and function more like hotels, with inviting lobby-like spaces where we gather and socialise with our colleagues, extended tables and benches where we can commune and bond as teams, and temporary work pods that we check into and out of on an as-needed basis. Forward-looking offices today also look and feel more like homes, with spaces for meeting and gathering as well as semi-private spaces to retreat to for concentrated thought and focused tasks. Within these new offices, walls and partitions have come down and have been replaced by loft-like, flexible "hackable" spaces that can be reconfigured with a lot of ease and little expense. Global carpet tile manufacturer Interface has looked to the world around us to seek inspiration for Human Nature, their latest flooring collection, based on the idea that naturally-inspired workplace interiors can support wellbeing, harmony and can help create a flexible, informal, barrier-less work environment. These carpet tiles – inspired from the visual and tactile textures of forest floors, grassy fields and pebbled garden paths – can be mixed and matched to create room interiors that reflect the variety of the natural landscape, as one surface gives way to another. They can also be used to define open spaces, delineating the transition between functional areas, offering architects, designers and companies new options to reinterpret offices for the modern digital age – wallless spaces of temporary work pods with inviting areas where employees can meet and work as a team. "At Interface we are very inspired by biomimicry and biophilic design principles – the more we learn about our natural world, the more we're inspired to change the way we approach design," said Interface executive creative director Chip De Grace. 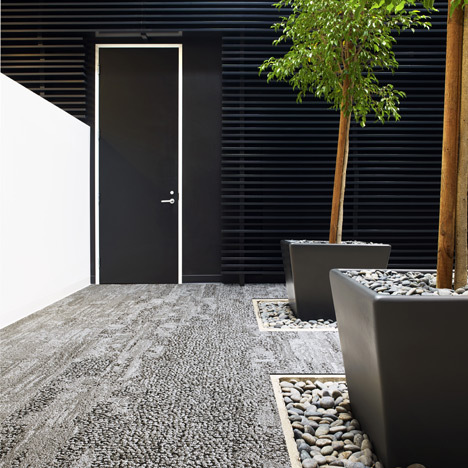 "When seeking inspiration we always ask "how would nature create an interior floor?" These planks remind us of the materials, textures and tones we find in the natural world and are ideal for composing imaginative floor designs and encouraging design diversity. "In Human Nature we've combined the best of both worlds — the hard surface look of planks with the benefits of soft, textured carpet tile that feels comfortable and natural underfoot," Oakey said. "Shape-shifting times call for inspired spaces that enable us to be connected, yet distinct, like colours in a rainbow. And if such surroundings can at once communicate the subtlety and richness of nature, yet change and evolve as we do, they can bring out the very best in our complex and glorious human nature." And when design is completely fused with the natural world, Interface's dedication to sustainability becomes even clearer. This is something the company has been doing for two decades now and that has evolved into its Mission Zero commitment: the promise to eliminate any negative impact Interface has on the environment by 2020. The Human Nature collection embodies Interface's 20-year history as a sustainability pioneer. Made with 100 per cent recycled content nylon yarn, partly derived from the innovative NGO partnership Net-Works, it is globally manufactured in Interface factories that are on average 39 per cent more energy efficient and consume 83 per cent less water than when the company began to rethink its impact on the environment. Want to learn more about Human Nature and Interface? Follow the hashtag #IFinHumanNature on twitter, get in touch with Interface or visit the company's social media channels for exclusive content and inspiring images. Interface is the world's largest global manufacturer of commercial carpet tiles. Its flooring products combine beauty and innovation with functionality and environmental credentials to help customers bring their design vision to life. It was one of the first companies to publicly commit to sustainability, when it made a pledge in the mid-nineties to eliminate its impact on the environment by 2020. Known as Mission Zero, it influences every aspect of the business and inspires the company to continually push the boundaries in order to achieve its goal. Interface is now more than half way to reaching Mission Zero and has been widely recognised for its achievements to date. Its products have also achieved several awards, specifically for design and innovation, the most recent being The Athenaeum Good Design Awards for Fotosfera and Urban Retreat.